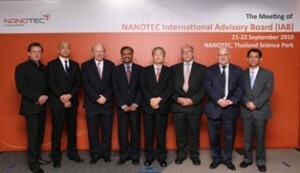 At a recent Meeting of the International Advisory Board of the National Nanotechnology Center (NANOTEC) in Thailand Science Park, Prof. Heinrich HOFMANN, Director of the ERU Surface, Coating, and Particle Engineering (SPERU) Ecole Polytechnique Federal de Lausanne, EPFL, Switzerland said “the objectives of visibility in a research setting is to increase human resources (researchers), attract research grants, and inform key stakeholders”. Prof. Peter GRAY Director of the Australian Institute for Bioengineering and Nanotechnology, University of Queensland, Australia also a board member said “regularly and systematically engagement with the media is necessary and international visibility campaign strategy is a must if research institute is to survive”. The International Advisory Board members of NANOTEC meet annually in Bangkok to provide perspectives to senior management and researchers at NANOTEC.